134 riders from as far as London took to the start of the 2019 Magnificent 7 to tackle 24 miles with 7 competitive closed road hill climbs. The unique event, now in its fourth year consisted of senior men, veteran men and women all rewarded by scoring points based on their finishing positions over each finish lines around the steepest streets of Sheffield. The early spring weather was very kind with bright sunshine and a gentle breeze allowing riders to enjoy the views over the outdoor city. The total route climbed 3,200ft around Sheffield and finished with a handicapped bonus climb on the Tour de France KOM point on the Cote de Bradfield. 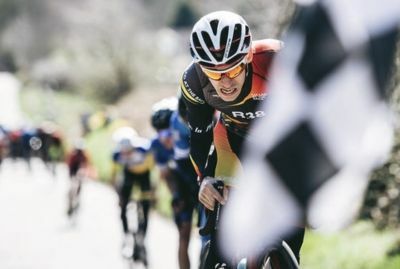 The pairing of Kieron Savage and Joe Clark riding for Cycling Sheffield were challenged this year with the presence of former National hill climb champion Adam Kenway in Vitus Pro cycling colours. Climbs 1 and 2 were tackled as a mass start as points from these two climbs would count towards the handicapped 8th climb. Defending men’s champion Savage came into the final few hundred metres neck and neck with Kenway but it was the Savage who took maximum points on climb 1 of Stoneface Hill. Savage’s Team mate, Joe Clark took 3rd. Savage and Clark went on to to dominate with another 1-2 on Hagg Hill with Kenway proving his consistency in third. Kenway, back the UK after a heavy training block in Spain was unsurprisingly fatigued so he couldn’t quite match the pace of the Cycling Sheffield pairing. Further back on climbs 1 and 2, former Magnificent 7 winner Andy Nichols, B38 / Cycles in Motion was consistently scoring points which would help him in the overall standings. Climbs 3, 4 and 5 were sprint climbs with Savage taking the new climb of Ranmoor Crescent ahead of Kenway. One of the youngest riders, Kieran Smith, MI Racing Academy easily winning climb 4 of Harcourt Road / Spring Hill and the spectator lined climb of Blake Street with some fine uphill sprinting. Hot on his wheels were still the trio of Nichols, Kenway and Savage with Clark slipping back on the shorter climbs. New for 2019 was Waller Road and it’s ridiculously steep assent saw Savage again come out on top with team mate Clark two bike lengths ahead of Nichols with Kenway hauling himself over the line in 4th. The final climb of Long Lane saw Nichols power his way to his first victory over Clark and Savage with climb 4 and 5 winner Smith ahead of a visibly tired Kenway in fifth. Despite his fifth place the Vitus Pro Cycling rider earned enough points to secure 3rd place, Nichols’ win on the last climb and constancy over the whole event gave him 2nd overall but it would be defending champion Kieran Savage, wearing number 1 who came out victorious for the Sheffield based team, Cycling Sheffield. 4th overall went to Joe Clark, Cycling Sheffield and youngster Kieran Smith, MI Racing Academy finishing a fine 5th overall. 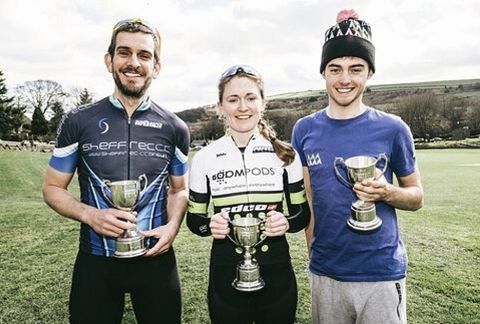 2018 Women’s champion Hannah Larbalestier, Team Boompods returned the defend her title and proved she was again in fine form by easily winning climb 1. The battle was on behind her with team mate, Hannah Ferran just pipping Fusion CC rider Abbie Taylor into second place by just a tyres width. The queens stage, Hagg Hill saw Larbalestier again easily beat team mate, Ferran with Beeston Road Club rider Yasmin Marks finishing 3rd but well down on the Team Boompods duo. The three sprint climbs saw Larbalestier continue her dominance with wins on Ranmoor Crescent and Blake Street but her clean sweep of wins were broken on climb 4 which saw Farran just take the win with a consistent Taylor finishing 2nd on Ranmoor, 3rd on Harcourt and 2nd again on Blake Street. The final two climbs again saw the two Team Boompods riders dominate with Ferran winning climbs 6 and 7. This was enough to beat the consistent Taylor into 2nd place. For a second year running it was Larbalestier who took the honours and again crowned Queen of the Mountains. 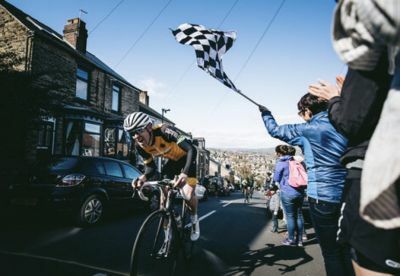 In the vets category defending champion James Allen, Sheffrec CC easily claimed a win on the first climb of Stoneface Hill and established a battle with Darren Hull, Fusion CC that would continue on all of the seven climbs. Allen, a second year veteran showed his strong early season form by easily winning Hagg Hill, Ranmoor Crescent and Harcourt Road. Blake Street saw evergreen hill climber, Tony Cope, Rotor RT easily win the short but steep punchy climb. Allen, who’s not a sprinter slipped back in 5th place. Second on the spectator lined climb was Brian Oakley, Prima Racing Team who travelled all the way from Whitby. VeloViewer’s Jon Wild was 3rd. Hull claimed wins on Waller Road and Long Lane to secure 2nd overall but was unable to overhaul Allen who would again crowned the veteran winner for a second year running. Rotor RT rider Tony Cope secured 3rd after a run of consistent top three finishes. In the 50+ veterans category, Sheffrec CC’s dominance continued with Stuart Bolton proving too strong for Killian Lomas, BMBO. Pete Clements, BBM rounded off the top 3. Sheffrec CC would like to thank Sheffield City Council for allowing eight road closures for the event, Trek Sheffield for the spot prizes and mechanical backup, Dave Coulson from Cycling Sheffield for driving the lead car, Stoneface Creative for the donation of a magnificent stone trophy and to the residents of Sheffield for support on all the magnificent climbs. Without their support this event simply wouldn’t happen.